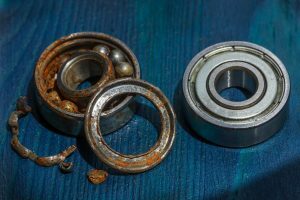 How Can You Protect Bearings and Help Prevent Equipment Failure? C&B Equipment, INC.BLOGSealsHow Can You Protect Bearings and Help Prevent Rotating Equipment Failure? How Can You Protect Bearings and Help Prevent Rotating Equipment Failure? Most pump bearings fail before their design life span, typically through no fault of either the pump or bearing manufacturer. What, then, is the leading cause of bearing failure? Research shows that 52% of bearing failures are due to contamination of the bearing oil. * In a study into equipment reliability conducted at a major refinery, it was estimated that 48% of all bearing failures were due to particle contamination and an additional 4% to corrosion (caused by liquid in the oil). Other causes included misalignment, disassembly, lubrication and overloading. The study also concluded that 40% of overall rotating equipment failures (pumps, mixers, gearboxes, etc) were due to bearing failure. How Does Contamination of Bearing Oil Occur? Wear particles, dirt and other contaminating debris can enter bearing housings through equipment shaft openings, vents and breathers. Water, one of the most common contamination sources, can leak into the bearing housings from external sources during operation. These external sources can include spray from failed packing or seals, area wash down, or leaks from nearby equipment. Another common method of water introduction is condensation through machine aspiration, in which moisture-laden air is drawn in due to pressure differentials. Bearing housings undergo frequent temperature shifts. As temperatures increase, vapors floating above the liquid oil level expand; as they decrease, the vapors contract. In a closed volume, increasing temperatures also cause pressures to increase, while decreasing temperatures cause pressures to go down. Preventing the introduction of contaminates is far easier and less expensive than attempting to remove them. Historically, the most common way of protecting bearings was to use a lip seal. Lip seals have served industries well for decades, and due to their inexpensive initial cost, they are still widely used. However, there are compelling reasons to replace them with modern bearing isolators, which are far more efficient. Lip seals rely on direct surface contact between the lip and shaft in order to form the seal, causing rubbing and wear. As a consequence, they can’t fully prevent contaminant ingress, and the rubbing may eventually score a groove and damage the shaft itself. They have a short effective life span, and when they leak, the loss of lubrication can cause bearing and equipment failure. Modern bearing isolators (also called bearing protectors) are designed to provide reliable protection against water and particle introduction in both operating and non-operating conditions. They last for many years when properly maintained. While there are many different designs, bearing isolators come in two general types: labyrinth seals and magnetic face seals. Labyrinth seals, such as the AESSEAL® LabTecta®66 Range, are designed to accommodate a range of shaft movements while protecting against contamination ingress. They are non-contacting, and so will not cause discernable shaft wear or damage after years of use. Magnetically closing face seals, such as the highly advanced AESSEAL® MagTecta™ Double Face Bearing Protector Range, make it possible to seal the bearing chamber. This not only protects against contamination ingress and lubrication oil loss, but prevents the “breathing” that leads to moisture contamination. Are you interested in saving your bearings and improving reliability? The experts at C&B can supply and help you implement the best AESSEAL® bearing protector seals for your specific application. Contact us today.